Allegra, when we talked about a year and a half ago, you were doing some cutting edge stuff with iTunes U, as well as a YouTube channel, Blog posts, and an interesting project with teens and podcasts. Allegra: Our iTunes U and YouTube presence continue to be very strong, but since we last spoke, we also launched a complete redesign of our website, MoMA.org, which features (among other things) an enhanced, centralized multimedia section with media widgets that can be placed throughout our site or embedded in other sites. This, and the subsequent increase in Web traffic we have been experiencing, means that more people are accessing MoMA’s media content through our own site as well as other channels like iTunes U and YouTube. In addition, we are also participating partners in ArtBabble, the art video site created by the Indianapolis Museum of Art. Our goal throughout is to create and showcase compelling resources on MoMA.org and distribute them to various other channels as appropriate. We also have an exciting series of exhibitions on view currently, a couple of which have accompanying in-depth subsites (moma.org/timburton, moma.org/bauhaus, and moma.org/gabrielorozco). And when we last spoke, we were talking about the architects’ blog on the Home Delivery exhibition site. Since that time, we’ve also launched Inside/Out, a MoMA/P.S.1 blog that has contributors across the museum. We’ve all been very pleased with the reaction it’s been getting, both externally and internally within MoMA. Those are just a couple of highlights, but there’s certainly much more! I'm really interested to hear about what you've learned along the way, and how you have refined or changed your activities as a result. Allegra: Well, the things we have learned along the way are probably too numerous to cover here—I think we learn something new each day—but I would say that the value of a great team and cross-department collaboration constantly gets reinforced. No matter the size of the institution or the resources available, there are never enough resources to do all the things that you dream of doing, but good people thinking creatively and working effectively can do great things together. Victor: The main reason, I think, is peoples’ interest in and regard for MoMA’s collection, its history, and in a sense, its “brand.” I think people want to engage with the content in MoMA’s collection and be associated with it in some way. MoMA’s collection covers disciplines that people are very passionate about: painting, drawing, prints, sculpture, design, photography, film, architecture, media and performance art. People may look to MoMA as an authority in these areas and want to take part in its communities. It also helped that we merged our page with another Facebook page that a high-school student had started a month before we started ours. I got in touch with the student a little more than a year ago to offer him the content that I was posting on our page. He was then a freshman in college and more than happy for me to be admin on his page (and he subsequently came and did an internship with me this summer!). I was able to have Facebook merge the two pages last spring. As well, we did run a modest cost-per-click ad campaign on Facebook for about a week a few months after we created our page, which did help get the word out about our page. Facebook ads allow you to target people by their interests, so it is an efficient way to target those who might be interested in your institution. What is your approach to facebook? Do you have some specific goals and metrics you are trying to achieve? Victor: Our main goal has really just been to create a space where we can interact with our audience and foster two-way conversations, and to hopefully get our content in front of people who may not be aware of MoMA’s exhibitions or collection but would be interested in them. It’s allowed us to reach out directly to where a lot of people are already, and to open a direct line of communication between them and the museum. As well, Facebook and Twitter are great tools for listening to what people are saying about MoMA, whether positive or negative. These are conversations that are going to take place if we’re there or not. It’s helped us garner feedback and learn more about our audience, both online and in the museum. Victor: Since most of my day is spent on other projects, I do what time allows. For Twitter, an application like TweetDeck has been essential in helping to organize the information overload that is Twitter. I have columns in the app’s interface that list tweets mentioning “Museum of Modern Art”, “MoMA”, and, of course, “@MuseumModernArt.” It really helps in finding out what people are saying about MoMA. I absolutely agree, though, that what is important here is not quantity, but the quality of engagement. That is where the ‘value’ is for an institution and its audience. That is what will create closer relationships between the two and help to create a passionate community. Are there correlations between fans and visits to the museum, or is that even the right question? I've been saying that people should find ways to integrate online and offline activities. Would you agree? Victor: I can’t say we really have any hard numbers to show, but we have received a fair amount of anecdotal evidence about people visiting the museum or attending events and educational programs from hearing about them through these channels. At the same time, about 42% of our Facebook community is outside the United States (and that’s about the same percentage of international visitors to our website). The top cities after New York in terms of fans are Milan and Rome! At one time, Milan was ahead of New York. It has been very interesting to learn about where are community is from. Italy is very well-represented in terms of visitors to the museum as well. I would definitely agree that it is valuable to integrate online and offline activities. It is something we are working to do more and more. One of the big questions that is coming up for a lot of people is the issue of scale and reach. 'MoMA is a world renown organization, well of course people will fan them just because.....' How can a little organization with a very small staff adapt what you are doing, or should they? Do you have the sense that a different strategy is required for smaller orgs? Victor: I think there are a few things that are important for any size institution to keep in mind. This is not about blanketing people with marketing messages. People can sniff out blatant marketing in social media and it might as well be spam. This is about sharing content that your community is interested in and allowing them to share it with others. This can include giving access to the works in your museum, or sharing news about art outside your museum. I try to post things that have nothing to do with MoMA, and I think people appreciate it. It’s also about engaging people in conversation. So, it’s important to find your “voice,” one that shows personality and gives a human-face to the institution. I’d say it’s important also to get a certain amount of buy-in from key people in your organization and to educate internally about social media. It really helps to have ‘ears on the ground’ to find content within your organization that you may work with directly, but your community would appreciate. Any other burning insights you can share? Allegra: Try and avoid creating a silo for your content—think across as many avenues and channels as possible without swamping yourself and your team with repetitive manual labor. We still have work to do ourselves in this area, but we’re making progress! Thanks so much Allegra and Victor!!! So its interesting because it raises 2 questions in my mind. Second question is: WHere is ITunes U? Seems like it would be a natural collecting spot for people to find things. Just my 2 cents. I had the great pleasure of talking with Allegra Burnette, Creative Director of Digital Media at the Museum of Modern Art in New York. Allegra and her department oversee all the ‘public facing’ media at the Museum which includes the design and production for the Museum's Web site, MoMA.org, as well as interpretive kiosks and displays. Their focus has been on developing the experience for the online visit, as well as the visit to the museum. As a result of a Bloomberg Grant, MoMA has been able to make its audio programs available for free, including online for download without being in conflict with any revenue stream. Most museums have to create new content for the web because they have to charge a fee for their audio tours. “The grant from Bloomberg not only enabled us to offer the audio program for free within the Museum, but it provided the opportunity to repurpose our audio tours for use online. What this means in part is that you can download the programs to your ipod and bring it with you during your visit or listen at home. We recently extended this initiative by working with Apple and becoming part of their educational program, iTunesU, which was recently expanded when it became part of the iTunes application. You can find iTunes U, by opening up the iTunes application and opening iTunes Store if it’s not already open. iTunes U is at the bottom of the iTunes Store menu. MoMA can be found in the “Beyond Campus” Category on the lower right portion of the screen. Sometimes it’s also featured in the graphics in the center section. “Its been great”, continues Allegra, “We’ve had a lot of people get the audio from MoMA.org, but it also really expands the audience for that material and gets it to an audience we are really trying to reach – educators and students. 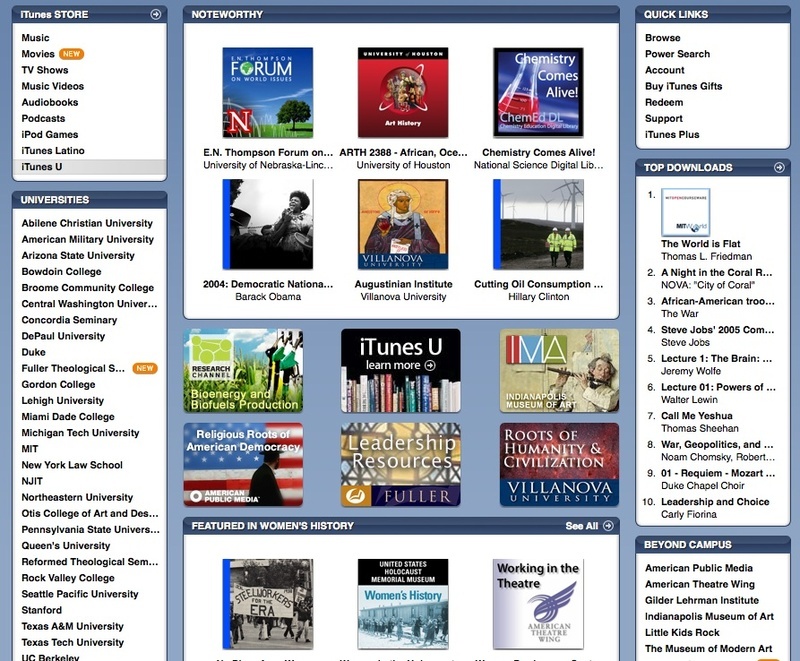 The audio tours as well as other material is in the iTunes U. You can listen online or download it. That’s been one of our big focuses - making sure we are reaching beyond our website and reaching our audience where they happen to be. In the case of students, and educators and scholars, they’re starting to use iTunes U for courses and as a research tool. Since they launched in October 2007, they've had about 20,000 downloads a month, which includes anything from full video to short audio clips. There is a whole Red Studio site for teens, with other activities. So some of the students have been working on the podcasts and some are doing other projects like interviews with artists that are turned into videos. MoMA also recently started a YouTube Channel. For a recent popular video for their Richard Serra exhibition, they used time-lapse photography to capture the entire installation process. Currently there are about 37 videos up now, as well as some film trailers promoting MoMA’s film program. A fun project coming up is ‘Home Delivery’ – about prefab architecture. Five prefab houses are going to be installed in the empty lot next to the museum as part of its exhibition. Architects are working on their projects at their various factories and then will bring them in to be installed. Each architect will capture the whole process in blog ‘journals’. The postings will include images, video or text. Second Life - Build or Visit? and design and is open from February 24 to May 12, 2008. Twittervision, created by Dave Troy is this cool little app that’s a mashup between google maps and Twitter, where you can see twitter posts in real time mashed up onto where in the world they are coming from. Troy has also created another version called Flickrvision that mashes google maps with photos that have been uploaded to the Flickr photo-sharing site. These are part of the ‘Design and The Elastic Mind’ exhibit also curated by Paola Antonelli, It is a fascinating look at the intersection of design, technology and science, how they come together and how they play off of each other. The exhibit contains an online piece that captures images and videos from some of the exhibits at the MoMA. 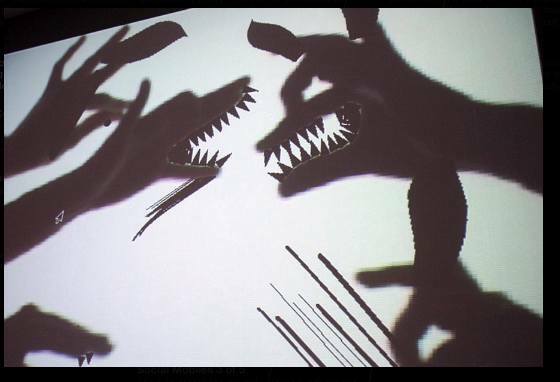 The exhibit includes all sorts of intriguing items, from the video project called ‘Lightweeds’ - of plants that grow and respond based on the weather outside, to the ‘Shadow Monsters’ – which takes your image and then adds ‘monsters’ to it. Allegra says... “So many of these objects – some of them may not be so eye catching initially, but each as a story about why they are there...” and they look way cool. A must see for me for next visit to Big Apple.